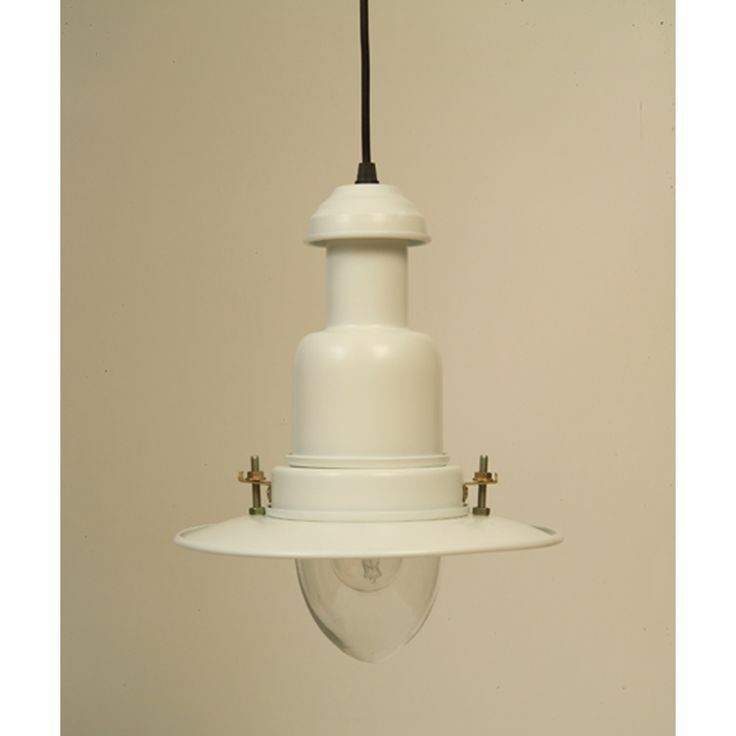 These fixtures contain several T5HO tubes as well as a reflector that will angle the light flux toward the work space to ensure optimal visibility. Many high ceiling lighting solutions offer additional features that are perfect for warehouse installations such as preventing loss of light due to the accumulation of dust, protecting luminaries against damage and facilitating their maintenance. Read about Luminaire Dirt Depreciation. Frequency with which the warehouse space is used. Uniformity of use. Intelligent controls will produce better results when used in areas that are not used as frequently. Cost of maintenance – should include the cost of replacement, labor and equipment charges and the cost of disruption of business activities. The desired temperature of the store. For cold temperature storage facility – Light emitting diode based lights that produce less heat are highly desirable for cold temperature applications. Add motion sensors to your warehouse lighting retrofit project and you could save as much as 70% more energy. Don’t worry, reduced costs doesn’t mean less light, our clients typically realize twice the light using half the energy. Light is needed in a warehouse to help in identifying workers and goods alike, reduce the risk of accidents and help in navigating aisles. Different areas of the warehouse are used for different purposes and may have varied lighting needs. A warehouse need not be a dark, dull and depressing area. 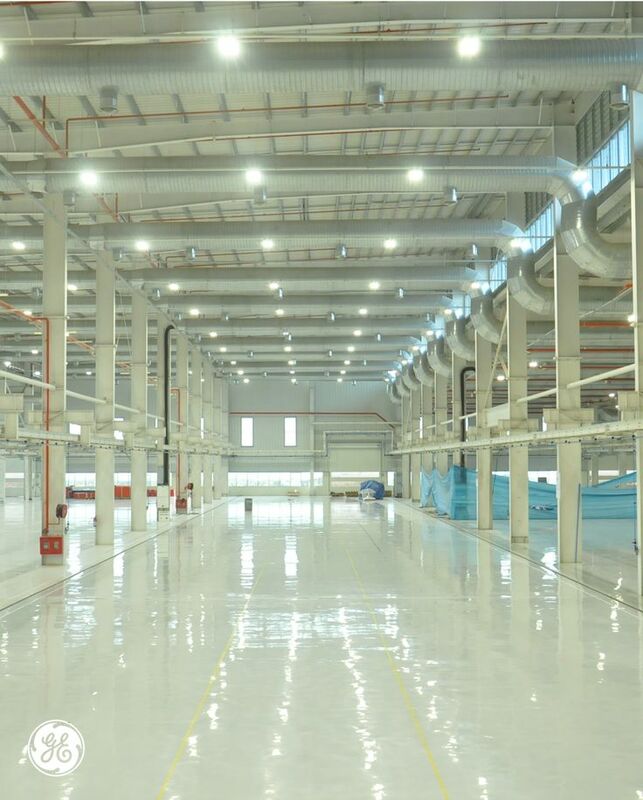 With the right lighting technology, such as LED Warehouse Lighting, it can be a comfortable haven for workers. Warehouse facilities can also benefit from the use of T5HO fluorescent luminaires instead of LED luminaires. When choosing the right lighting technology for warehouses a number of factors need to be considered. Mercury Vapor lights – have poor color rendering index and low light output per watt. High Pressure Sodium lamps – have a lamp life of 12,000 hours, poor color rendering index but good raw lumens output. One of the most common uses for these lights was in open parking areas where color discrimination is not important. However even in this application Sodium lights are losing to better and more economical lights based on LED technology. Metal Halide lamps – have a lifetime of 12,000 – 15,000 hours and good color rendering properties. They are expensive compared to other HPS light sources. Fluorescent tubes– generally used for lighting indoor spaces these are not suitable for low temperature operation making them unsuited for use in cold climates and in cold store locations. The problem of mercury contamination and short life span (compared to LED) also dog these lights. LED Technology – the last word in lighting efficiency. They produce high CRI directional light. The lumens achieved at desired points are therefore better. In energy efficiency these lights are incomparable. A LED 100 watt retrofit can replace a 400 watt Metal Halide bulb (consumes 455 watts when you take ballast draw into account). Lamp life is generally 50,000 hours or more. An added plus is that these lights are not affected by on off cycling and are amenable to control by intelligent systems further increasing the possibilities of energy savings. Warehouses with high ceilings demand a specific lighting system in order to make sure the space is sufficiently bright to work in. Light distribution – High shelves can cause unwanted shadows on the floor. Using fewer but high power lights can provide the required illumination but will lead to glare making life uncomfortable for workers. The logic behind using high power lights is that there are fewer light fixtures to service. With LED bulbs and tubes that last a decade or more this logic is now defunct. Many smaller lights can now be placed in the warehousing facility to achieve uniform light distribution and effective control without sending the maintenance costs out through the roof. Lamp lifetime – Lamp lifetime is not just about the day the lamp will stop burning. The end of useful life is what facility managers are worried about. Warehouse managers therefore look at how well lumens are maintained over the life of a lighting device. Solid state, Light Emitting Diode based lights maintain the lumen output well over their life time. Since each light is a cluster of diodes the possibility of all of them failing simultaneously is also remote. At an average labor cost of $60 per hour each replacement would cost $45.00. If an outdoor light needs replacement the cost will be higher as a truck or special ladder may be needed to access lighting fixtures and more than one personnel may be involved. Activity Time in minutes 1. Staff documents light failure and places a call to maintenance personnel 10 2. Logging the call and scheduling 5 3. Arranging replacement lamp and personnel 10 4. Reach location of light failure and replace lamp 10 5. The US Department of Energy (DOE) estimated that solid state, Light Emitting Diode based lights can potentially help save 1,488 terra watts of electricity valued at $120 billion between 2010 – 2030. Simultaneously the green house gas emissions will come down by a stupendous 246 million tons. The report does not factor in the savings achieved by directionality of these lights or the fact that intelligent controls can further help businesses save money on lighting. The estimated additional savings from these two factors are estimated to be between 30 – 50%. Lighting Retrofits Lighting retrofits pay for themselves, adding to your bottom line. Many manufacturers & warehouses still use outdated lighting. Converting to LED or T5 high bay fixtures can save 50%-70% on your lighting energy cost and provides more light! Most Metal Halide and High Pressure Sodium Lamps (HID) that are used in warehousing facilities do not achieve full brightness instantly and have significant warm up times. Some HID lights also have an extended re-strike time (the lamp must be allowed to cool before it can be switched on again). This severely curtails the possibility of using occupancy sensors and other intelligent control systems. It should be noted, however, that the initial purchase of a LED lighting system is a costlier investment than the simple purchase of traditional established lighting. 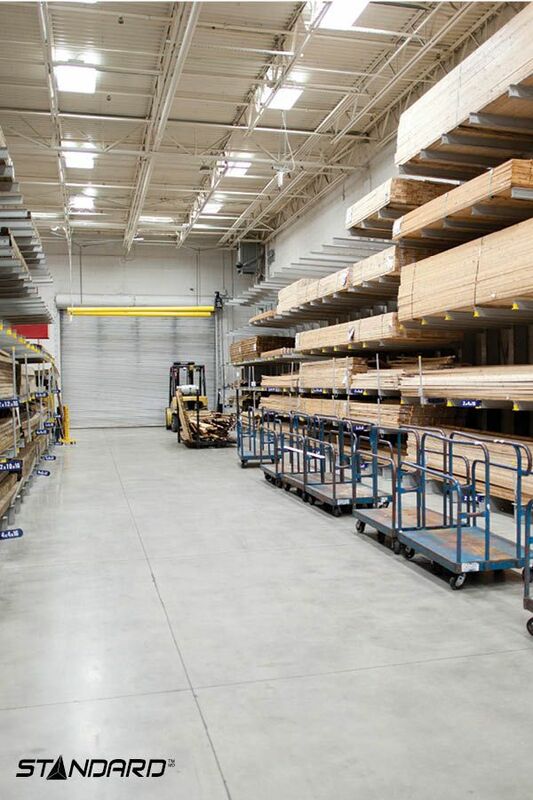 When considering an overhaul of your warehouse lighting, you may also examine fluorescent lighting options. 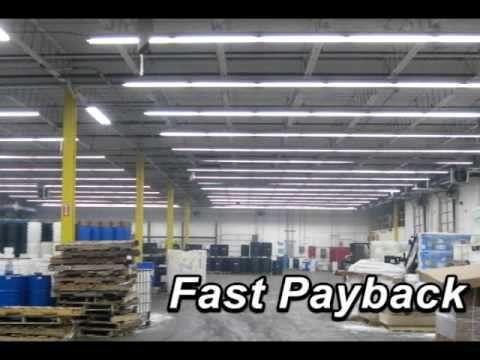 Following are a number of solutions that will simplify the lighting choices for your warehouse. Energy Savings We’ll provide your payback analysis & explain how an LED or T5 high lighting retrofit could save your business 50% or more on your electric bill. This savings translates to company profits! Get a risk-free energy analysis today. 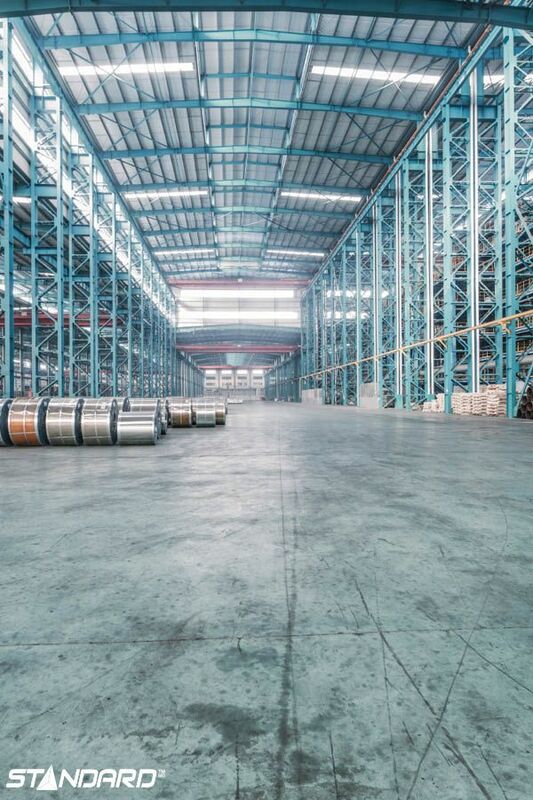 Efficient warehousing is an integral component of the supply chain strategy of businesses in a globally networked world. New technologies and material handling procedures are revolutionizing the warehousing world. Bar coding, radio frequency tags, new packaging and efficient containers are changing the way goods are stored. Efficient warehousing and reduced supply chain costs are an integral part of the strategy of the likes of Walmart. Light color rendering index (CRI) – Good color rendering index lights improve the appearance of goods and make it easier to distinguish between instructions printed in different colors. Poor CRI sodium vapor lights are generally not preferred partly because they may make everything look a sickly shade of yellow and partly because of the effect on motivation that long term exposure to sickly pale light can have. Finally, a LED lighting system significantly lowers heat output. Therefore, it is not necessary to air-condition a warehouse to counteract the heat produced by the lighting fixtures as LED lighting minimizes the cost of air conditioning. We call this “the cross-effect of lighting conversion” and it is an essential feature in the computation of cost savings. To learn more about cross-effects of lighting conversion, read Cross-Effect of Lighting Conversion. How It Works The savings from your electric bill pays for your lighting upgrade. We work around your schedule so we don’t interrupt production. Upper management won’t spend an hour or two on this entire cost reduction initiative when you work with ROI Energy. 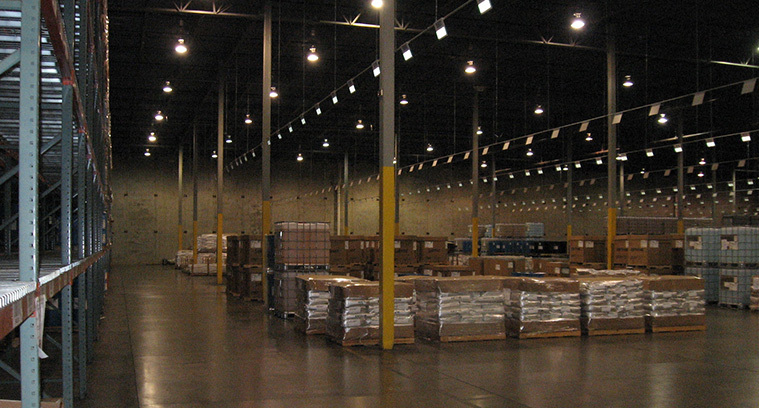 Lighting needs are responsible for 1/2 to 3/4 of a warehouse facility’s electrical needs. Lighting was long considered an area in which costs were difficult to rein in. The only possible solution was to call the lighting contractor every couple of years to replace old inefficient tubes or fixtures. With LED lighting systems this circle is all set to change – after all the technology delivers 50%+ direct energy savings over fluorescent technology and up to 75% on Metal Halide and High Pressure Sodium and these lights will continue to be in service for a decade or more. Recommended horizontal lighting levels range between 10 foot candles for inactive areas to as high as 50 foot candles in high activity areas where small items are handled. Good vertical illumination is needed to enable employees read labels. In general for an area that needs 10 foot candles of horizontal illumination 1 foot candle or more of vertical illumination (10:1 ratio) is generally recommended. It is not just the average lighting levels that are important – the minimum levels (3:1 ratio) are also important. Thus with an average illumination of 30 foot candles the minimum illumination should be 10 foot candles. 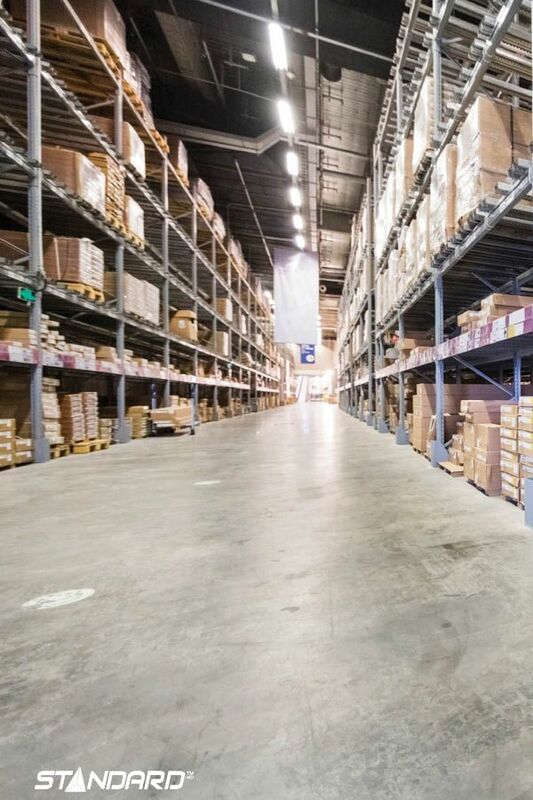 The Illuminating Engineering Society of North America (IESNA) prescribes a set of guidelines for safe and comfortable lighting levels in warehouse facilities. Posted in Lighting Aplication Recommandations, Our Online Journal. Last updated January 16, 2018. Additionally, the cost of installing these luminaries is modest and the lighting quality is quite adequate. Several solutions are available to light a warehouse both properly and efficiently. A system that is well adapted to the space will serve to improve work habits and the well-being of employees while reducing maintenance fees and the cost of luminaires. LED fixtures have become the buzz tool in the lighting industry; they are very well suited to warehouse lighting. LED highbays offer top performance as well as exceptional quality and versatility. They utilize 60% less energy than traditional fluorescent and HID lighting systems. Moreover, they are designed to reduce your energy consumption costs while providing your warehouse space with regular, contemporary lighting. Our LED luminaires for high ceilings are designed for 18- to 60-inch mounting heights and will supply up to 95% of lumens for up to 60,000 hours. They are well suited to high ceilings (varying from 10 to 60 feet) and will ensure superlative quality, high performance lighting. They provide constant brightness with both direct and indirect lighting. Overhead lights are needed in loading areas for general illumination for better safety during loading procedures. Supplemental lights may also be needed to further improve illumination in certain cases. 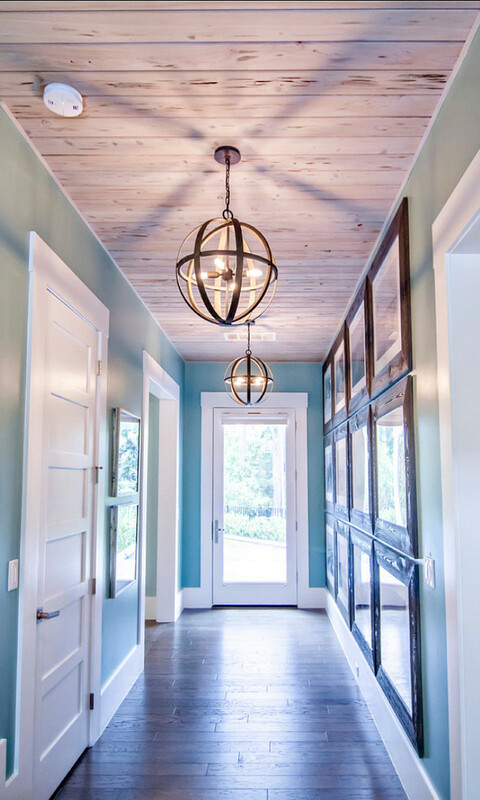 It is important to determine the lighting needs in each area and design lights accordingly. It is good to remember that something that cannot be measured cannot be controlled. At workstations low glare lights that enable office staff to comfortably read documents is needed. Good horizontal and vertical illumination is required for open storage areas as the aisles may be repeatedly reconfigured. Similarly good lighting is needed in rack storage areas. Besides these, lighting levels in a warehouse depend on the activity pattern, space design (open or confined), age and visual acuity of workers and size of items. 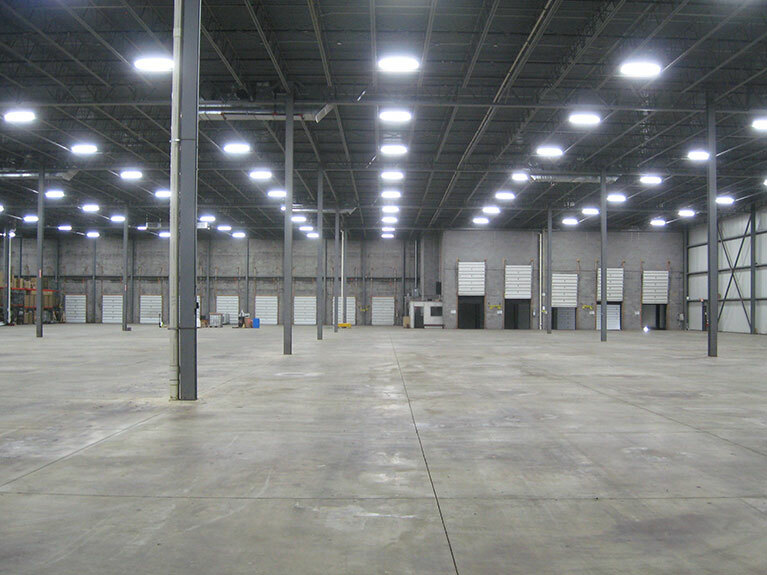 As a thumb rule, the cost of lighting a warehouse is around $1 per square foot per year. With energy efficient solid state lights based on cutting edge LED technology this lighting energy consumption can be reduced by 50% to 90%+. For a 200,000 square foot storage facility lighting costs can fall from $200,000 per year to as low as $50,000 per year. Coupling these instant on, flicker free lights with intelligent lighting control systems can further help reduce lighting costs down to as little as $10,000 per year. Light Emitting Diode based lights are solid state lights that are not affected by on-off cycling. They are therefore perfect for pairing with intelligent lighting control systems that provide real time, dynamic lighting level control. By any yardstick, the saving potential is substantial. Life time cost of lighting – These include onetime cost of lighting devices, energy costs, set up costs, replacement costs, cost of labor for replacement, cost of safe disposal of bulbs, cost of ordering and storage of replacement bulbs. If a warehouse believes in offsetting its carbon foot print the cost of carbon emitted must also be factored in. Some experts believe that in keeping with the triple bottom line approach to business, other environmental and social costs of lighting should also be calculated. On each one of these LED lighting trumps the competition. 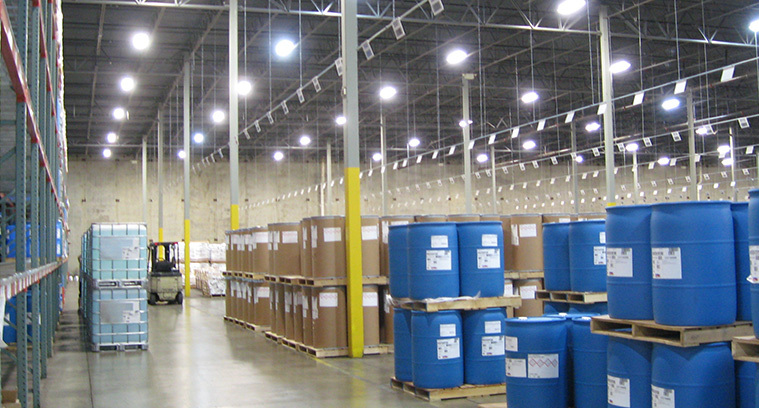 Are you ready to reduce your warehouse energy costs with more efficient lighting? Who doesn’t want a better lit warehouse? You’ve come to the right place. We’ll make your entire conversion a pleasure. You’ll be glad to contacted us. 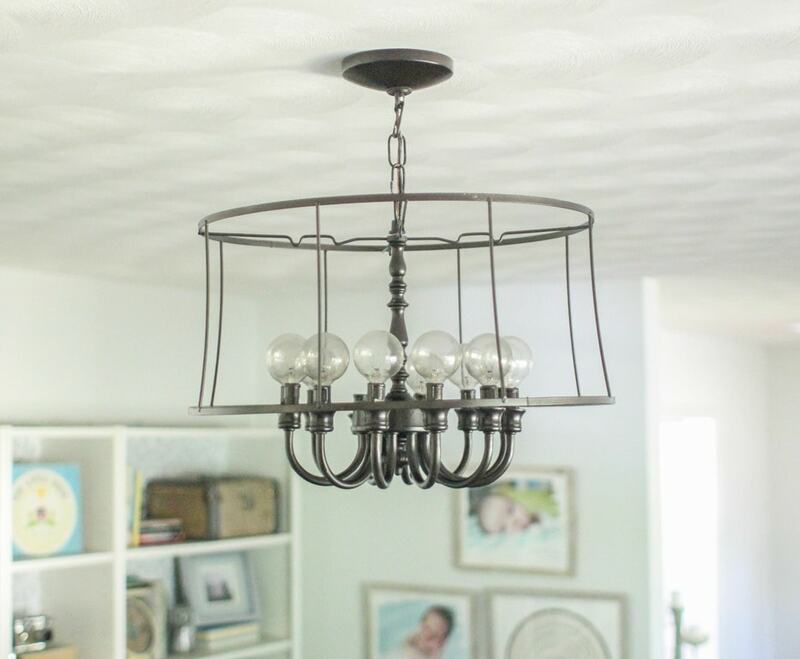 Look at how much energy you can save by converting your light fixtures! Metal Halide high bay fixtures = 458 watts of energy 4 lamp T5 high bay fixtures = 234 watts of energy LED high bay fixtures = 123 watts of energy Start saving today. Benefits of LED lighting include, among others, a longer life span. Ceiling height and the considerable number of fixtures in this type of space result in significant maintenance costs. Changing a simple light bulb often involves an elaborate process, such as the use of a forklift that can be quite costly in both time and dollars spent. LED maintenance and energy consumption are modest, two factors that represent major advantages in large spaces with high ceilings. Efficiency or light output per watt – Lumens or foot candles per watt is a measure of the energy production efficiency of a lighting device. A drawback of this measure is that it measures the light produced by the bulb. It does not consider how much of the light produced by the bulb is wasted. LED light bulbs produce directional light as opposed to other light sources – far fewer lumens are needed to illuminate the target area. Measuring lumens achieved at the surface of interest are a much better measure of lighting efficiency. No-Risk Energy Analysis ROI Energy will conduct a risk-free energy analysis to determine your savings potential . Get started today by submitting this form to find out how much you could save. As owner of ROI Energy, I promise you won’t be disappointed.